Goat Range Provincial Park is situated in the Selkirk Mountains of the Kootenay Region, between Slocan and Kootenay lakes at the south end, and between Arrow Lakes and Duncan Lake to the north. 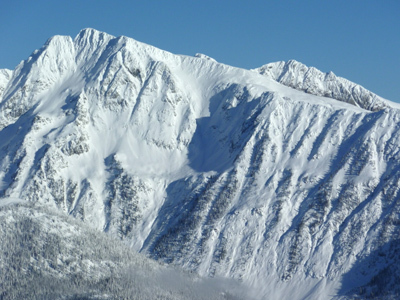 The peaks of the Goat Range are known for their rugged features and sometimes glaciated peaks. Because of this, terrain in the Goats may have more in common with the northern Selkirks, around Rogers Pass, than with many routes further south—there are also some remarkably long tours, and descents, to be had here. 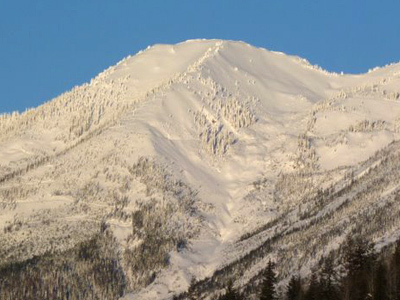 These routes are good for backcountry day trips because they are very close to New Denver and Kaslo (about ½ hour or 45 mins.) and about 1½ hours from Nelson. They also tend to hold the snow a little longer than many routes in the interior and, accordingly, are good for spring backcountry tours. All routes listed here provided by Mountain Sense. If we have missed anything please let us know? From the parking area, follow a logging road up into the forest a short distance and turn right at the first intersection. Follow this road west (it may require boot packing if ploughed) staying right at subsequent forks, across the bridge over Whitewater Creek and contouring around a broad shoulder until Lyle Creek becomes visible. Here the road turns northeast and gradually climbs up into the forest staying high on the climber’s left side of Lyle Creek. When the forest opens up again, the steep headwall ahead can be bypassed on the left where the road switch backs up the open slopes. A treed rib begins to the right of the road that gains a good bit of elevation before tricky route finding forces you left onto steep slopes and gullies or right into cliffs in the forest. At about 1980m/ 6500’, the angle eases as you enter the lake flats. From here many backcountry skiers ascend the gully at GR 925462 (NAD 27). This is a serious terrain trap with multiple overlapping slide paths. The lake at 2025m/6650’ makes a nice camp spot if you pitch your tent well away from any avalanche runouts. The southeast facing slope just west of the lake is steep but broken up by tree islands and may be a safer option (depending on sun effect). Above treeline, the route choices are many and finding the lowest-angled terrain can be tricky in flat light. Keep your eyes peeled for all the great descent options. Note that the map shows a glacier on the SE side of the peak (although it seems to have receded a fair bit). This is truly a classic ski objective with all the requisite ingredients for a great adventure. The panorama from the summit is world class and the ski terrain is endless. You will want to keep coming back for more! ACCESS: Travel on Hwy 31A aproximetly 20km West of Kaslo or 26km east from New Denver to Rossitter Creek FSR. Head north off the highway and follow the forestry road 1.2km and turn left at the fork, travel to 2.4km and veer left at the intersection. Stay left and cross Rosssitter Creek bridge at about 3.5km. At 7km find the trailhead. Park here and hike up the path and follow the road across Lyle Creek bridge. There is a ladder on the upper side that leads the rest of the way. After crossing Watson Creek, the logging road gains about 460m/1500’ of elevation before reaching a fork. Heading left crosses a slide path to gain the southeast ridge (steep and exposed in places) of peak 7386 (labelled on the map). Going right across a huge avalanche path leads to benchy treed slopes and an old switch backing logging road. Climbing up to the north gains the ridge at about GR 856453 (NAD 27). From here the summit ridge crest sits about 245m/800’ above. Good route finding and terrain selection skills are required to reach the ridge line with reasonably limited exposure so be cautious. Lots of open terrain, lots of yo-yo options and lots of great skiing await off the ridge. The descent back to the car is all down and fairly quick (although sun effected snow can prove for challenging skiing, especially at the lower elevations). ACCESS: Drive east from New Denver or west from Kaslo on highway 31A to Fish Lakes. Park at a gravel pullout on the south side of the road. Cross to the north side and follow a logging road that climbs up into the forest switch backing a few times before heading west to cross Watson Creek. Note that the low road heading immediately west from beside the highway only leads to Bear Lake.